This is the next post in the series on my electric hot liquor tank. You can reference the intial post here. I want to reiterate my warning about mixing electricity with water. It can be deadly, and if you decide to venture into this, you do so at your own risk. Please get the help of someone who knows what they are doing, like an electrician. This is just to document what I did, and is not meant to be any sort of expert opinion or instructions. So, if you get hurt, it is your own fault. Well, at this stage in the process, I have a 10 gallon aluminum pot with a 1500 watt electric hot water tank element installed in the side of it. I also installed a thermowell, which is basically just a sealed tube sticking into the tank. Please reference the post about the basic build for details. So, in order for this to work, I need a way to turn the element on and off to help maintain temperature. Thus I need to be able to measure temperature, and I need to be able to cut the power on and off depending what the temperature is. I also want to do this automatically, as the idea of watching a thermometer and manually flipping a switch off and on, while easier then turning the burner off and on as I was doing previously, just is not what I was looking for. Enter, the Ranco ETC 111000-000. Basically, this does exactly that. There is a temperature probe that comes out of the top of the unit on the end of a long wire. The unit itself has a microprocessor that reads the temperature, and then turns the power off and on to the circuit. You can buy these already wired from various home brew supply shops, or you can buy the basic unit, and wire it yourself, and save some money. I ended up getting mine off eBay. This unit is rated to handle up to 16 amps, so it handles my element just fine. I decided to wire mine to a powerstrip. This lets me have a manual cut off to the element(I can just flip the switch on the powerstrip) and if I ever decide to use it in other applications (such as controlling a fan and cooling unit for a fermentation chamber…but that is for another time) I can plug in more then one thing, as long as it stays below the 16 amp total on the circuit. To do this, I just bought a power strip at the hardware store, cut off the plug, and wired it into the device. I just plug the unit into my GFCI outlet I use for brewing. 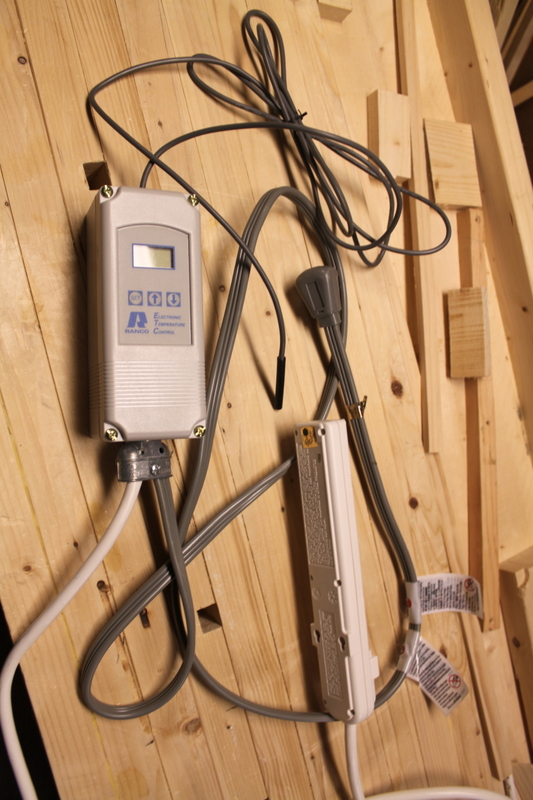 I then plug the element into the powerstrip, and I put the temperature probe into the thermowell. You just set it to the temperature you want, and the device does the rest. This works pretty well, and likely I could have stopped here. However, I was worried about the uniformity of the water temperature in the tank. To counter this, I needed to agitate the water. Yes, I could come by and stir it from time to time, but…what fun is that? Additionally, I am planning on ultimately using this tank to run a HERMS system when I get a pump for my brewing, so I wanted a stirring mechanism for a constant temperature. So, I built an electric swizzle stick that mounts on the lid of the tank, and I will go into that in the next post.